© Memarpour et al. ; Licensee Bentham Open. To evaluate the outcome of vital pulp therapy in primary teeth with irreversible pulpitis by using calcium-enriched mixture (CEM) cement according to clinical and radiographic assessment. Fifty primary molar teeth with irreversible pulpitis in 50 children aged 6-8 years underwent pulpotomy using CEM cement as the dressing material. Following pulpotomy, pain intensity was evaluated by use of a visual analog scale at 1 and 7 days from the treatment and in clinical appointments at 3, 6 and 12 months after baseline. Radiographic evaluation was performed at 6 and 12 months. Data were analyzed using the McNemar test. A total of 42 children (mean age 7.26 ± 0.82 year) completed the study. After one day treatment 56 % of children reported complete relief of pain and after 7 days 62% reported the same. However, two children complained of increased pain 1 day after treatment. None of the children reported pain in the subsequent appointments. One child complained of tenderness in percussion after 6 months. Pulp canal obliteration was the most common change in the radiographic assessment. There was no significant difference between clinical (92.8%) and radiographic (90.4%) success (p=0.990). Pulpotomy using CEM cement could present a successful treatment in primary molar teeth with irreversible pulpitis. Keywords: Calcium enriched mixture cement, irreversible pulpitis, primary teeth, pulpotomy. Preserving primary teeth until the eruption of permanent succeeding teeth is an important goal in pediatric dentistry. Sometimes clinical signs and symptoms indicate pulp involvement with irreversible pulpitis which leads to pulpectomy or tooth extraction . Pulpectomy is the first choice of treatment, although varying success rates have been reported for this (success rates 70-91%) [2, 3]. In addition, the treatment requires more time, possibly two appointments, and the procedure may be difficult for general dentists to perform and for young pediatric patients to tolerate.The treatment requires cooperation from the patient and it would therefore sometimes be better for young children to be hospitalized and to undergo sedation or general anesthesia for the treatment procedure. Consequently, some parents opt for extraction of the painful teeth in order to avoid the stress of the extended procedure . This preference for tooth extraction may also be related to financial restrictions . In such a situation, pulp treatment presents a substantial challenge for many dentists, meaning that treatment alternatives with new materials would be welcome. Vital pulp treatment with materials such as mineral trioxide aggregate (MTA) are explored in studies on new trends in dental biomaterials [5-9]. The successful use of MTA has been reported for partial pulpotomy of caries-exposed immature permanent teeth  and permanent teeth with irreversible pulpitits . The literature also suggests MTA as an alternative for formocresol in primary tooth pulpotomy [7-9]. Calcium-enriched mixture (CEM, BioniqueDent, Tehran, Iran) cement has been introduced as a new endodontic biomaterial .This water-based tooth-colored cement is a biocompatible mixture cement that releases calcium and phosphate ions to form hydroxyapatite to induce the formation of a dentinal bridge .The product is alkaline (pH > 10.5) and releases calcium hydroxide during and after setting [10, 11] .The clinical use of CEM cement is similar to that of MTA. As a result, the characteristics of this cement are compared with MTA in some studies, showing a shorter setting and working time for CEM as well as a lower film thickness . CEM cement also shows a superior antibacterial effect  and improved handling . Both have similar sealing ability . The stated advantages of CEM cement and its potential effect on healing of the remaining pulp and the induction of dentinal bridge formation have led researchers to recommend use of the material in pulp treatment procedures in permanent teeth such as indirect and direct pulp cap, pulpotomy [13-17], and root-end fillings . One of the benefits of CEM cement is in the treatment of permanent teeth associated with irreversible pulpitis. The results of some clinical studies suggest vital pulp therapy with CEM as an alternative treatment to root canal therapy in such case with irreversible pulpitis [13-17, 19]. To date, few studies have compared CEM cement and MTA as dressing materials for direct pulp cap and pulpotomy in primary molar teeth, but the small number of papers available have concluded that these biomaterials are suitable for the treatment [20-22]. However, no published clinical study has yet evaluated the use of CEM cement in pulpotomy in primary molar teeth with irreversible pulpitis. The purpose of this present clinical study was to assess the effect of CEM cement in the pulpotomy of primary molar teeth with irreversible pulpitis. The research protocol was approved by the Human Ethics Review Committee of the Faculty of Dentistry, Shiraz University of Medical Sciences. For this 1-year clinical study, 50 patients aged 6-8 years were selected from 3 Dental Clinics in Shiraz during 2013. All of the parents were told about the study and signed the informed consent. Inclusion Criteria: Clinical examination revealed extended carious lesion on the primary molar teeth surface not extending toward the root. All of the patients reported a history of pain typical of irreversible pulpitis ie; the chief complaints were of spontaneous pain lasting from a few seconds to several hours in the days before consultation. This radiating pain was exacerbated by hot and cold fluids and required analgesia for pain relief. The pain did not abate following tooth brushing or flossing. All of the parents were willing to join the study. All teeth were believed vital and the vitality of all the subjected molar teeth was checked by the operator during the pulpotomy procedure through visual inspection of pulpal hemorrhage. Exclusion Criteria: Patients with systemic disease or physical or mental disability, extremely poor oral hygiene, periodontal problems, signs of abscess or fistula or non-physiological tooth mobility and non-restorable teeth were excluded from the study. Teeth with external or internal root canal resorption, or root canal calcification in pre-treatment radiographs were also excluded [13, 14]. Teeth where hemostasis could not be achieved were excluded. Pulpotomy Procedure: The treatment procedure was performed as described for permanent teeth with irreversible pulpitis. After obtaining adequate local anesthesia with 2% lidocaine and 1/80,000 epinephrine (Darou Pakhsh, Tehran, Iran), the surface of the tooth was rinsed with normal saline and cleaned by swab wetted by a 0.2% chlorhexidine oral rinse (Shahre Daru, Tehran, Iran). Pulpotomy procedures were then performed with rubber dam or cotton roll isolation following complete removal of caries using fissure diamond burs (830l/012, Dia Tessin, Vanetti, Gordevio, Switzerland) and round stainless-steel burs. Pulpotomy was performed with a sterile round diamond bur (801/014, Dia Tessin, Vanetti, Gordevio, Switzerland) on a high-speed headpiece with copious water to remove all of the inflamed pulpal tissue. Following pulp amputation, the pulp chamber was irrigated using normal saline as well as cotton pellets wetted with normal saline for 5 minutes until homeostasis was obtained. Teeth where hemostasis could not be achieved were excluded. The CEM powder and liquid was mixed according to the manufacturer’s instruction and a base of approximately 2 mm of CEM cement (BioniqueDent, Tehran, Iran) was placed over the amputation site. A wet cotton pellet was used for adaption of the cement to the tooth walls. Then a further wet cotton pellet was placed over the cement and the teeth were temporarily sealed with zinc phosphate cement. After 1 week the patient was recalled for final restoration of the tooth with amalgam or a stainless steel crown. Prior to tooth restoration, the operator checked that the patient had no pain or clinical problems (ie; tenderness to percussion, swelling, fistula or mobility due to disease). A recall program was arranged for all patients and all of the teeth were evaluated clinically and radiographically. All of the procedures were performed by one operator. Flow diagram of study participants and distributions of post operative pain intensity during follow up appointments. 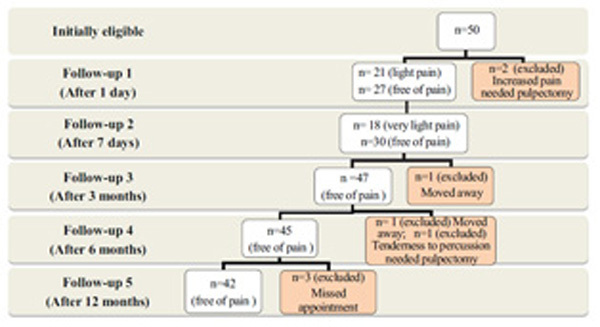 Clinical Assessment: Pain assessment was performed using a visual analog scale (VAS) of faces with a rating of between 0-5, at 24 hours from treatment, and again at 7 days and 3, 6 and 12 months after treatment. Clinical success was also reviewed at 7 days and 3, 6 and 12 months after treatment. The teeth were tested for tenderness to percussion, soft tissue redness, dental swelling, abscess and fistula indicating any extension of inflammation toward the root canals [13, 14]. The parents were supplied with a telephone number so that they could inform the dentist of any problems. Radiographic Assessment: No internal or external root resorption, no loss of lamina dura integrity, no periodontal ligament widening, and no alveolar bone resorption in the periapical region were considered indicative of successful treatment. Presence of radiolucency scored as follows: 0 - no radiolucency; 1 - radiolucency between ¼ of furcation to periapical areas; 2 - radiolucency between ¼ to ½ of furcation to periapical areas; 3 - radiolucency more than ½ of furcation to periapical areas. Teeth with a score of 0 and 1 in which teeth underwent physiologically normal root resorption as well as pulp canal obliteration were considered indicative of successful treatment. The clinical and radiographic assessments were all performed by the same two calibrated dentists, who calibrated their judgments through the examination of 10 patients. Where there initial was disagreement, consensus evaluations were performed by the two examiners. Data were described using frequency (percentage), mean and standard deviation of each criterion. Also, the McNemar test was used to assess the differences between clinical and radiographic findings after 12 months. A total of 50 children with the mean age of 7.26 ± 0.82 years met the inclusion criteria. After one day of treatment, 2 of the 50 patients reported increased pain at the first follow-up appointment. The treatment was deemed to have failed for these patients, so the teeth were then treated by pulpectomy and they were excluded from further study. The remaining 48 children were recalled for further follow-up at 7 days, 3, 6 and 12 months. In the 3-month and 6-month follow-up period, one child needed pulpectomy treatment and 2 children changed their place of residence and did not attend their follow-up appointments. At 12 months after treatment, the parents of a further 3 children dropped out of the follow-up evaluation. Therefore only 42 children (23 male and 19 female) attended the 12-month recall appointments. At 1 day after treatment, 21 (43.7%) children reported light pain and 27 (56.3%) were free of pain. After 7 days, 18 (37.5%) children had very light pain, while 30 (62.5%) reported no pain. There were no reports of any pain in the later follow-up appointments. At the 7-day and 3-month follow-up sessions clinical examination showed no tenderness following percussion test, no signs of soft tissue redness, swelling, dental abscess or fistula. Only 1 case (2.2%) showed redness and tenderness to percussion at 6 months after treatment (Fig. 1). Number and percentage of radiographic outcome after 6 and 12 months. Postoperative periapical radiographs of second mandibular primary molar with internal root resorption in distal root canal (arrow). Radiographic evaluation at 6 months after treatment showed 1 case (2.2%) of radiolucency at the furcation area (score 1) and 1 case (2.2%) of widened periodontal ligament. The remaining treated teeth did not show any radiographic changes. Radiographic assessment after 12 months gave the following results: 1 case (2.4%) of internal resportion, 1 case (2.4%) of radiolucency at the furcation area (score 1), 3 case (7.1%) of radiolucency at the furcation area (score 2), and 7 (16.7%) cases showed pulp canal obliteration (Table 1, Fig. 2). Overall, successful clinical treatment was seen in 92.8 % of the teeth, with radiographic success of 90.4% where radiolucency at the furcation area (score 1) and pulp canal obliteration were not considered as failure. There was no significant difference between the clinical and radiographic assessment findings (p=0.990). Vital pulp therapy is a procedure in which inflamed pulp tissue is removed and covered with a suitable biomaterial to heal the remaining pulp . Some clinical studies into the use of MTA or CEM cement show that vital pulp therapy as an alternative treatment for permanent teeth with irreversible pulpitis [5, 6, 13, 23]. Dental pain associated with irreversible pulpitis is a major factor in parents seeking dental treatment. The results of the current study showed that more than half of the patients reported no pain after 24 hours and at 7 days from treatment, while some reported very light pain through use of the VAS scale of faces;  a nonverbal reporting method used for identifying intensity of pain among young children. Our findings in relation to the reduction of pain are consistent with previous clinical studies in permanent teeth in adults [13, 17, 19]. However, identification of the intensity of pain by children may be influenced by factors such as their age or previous experience of toothache of varying severity . The present study included 2 instances of severe pain at 24 hours after treatment. This may have been due to the presence of hyperemic dental pulp in the canal irreversible inflammation that was unresponsive to the treatment. In 1 case, tooth tenderness was also observed at 6 months, indicating treatment failure. Overall, however, the clinical success rate of vital pulp therapy with CEM (92%) was almost on a par with pulpectomy outcomes in primary teeth [2, 3]. Where no clinical findings were present the teeth were also assessed by radiography, as root canal changes may be present and asymptomatic in some cases. The radiography findings were consistent with previous studies , showing a slightly lower success rate than that demonstrated in the clinical findings. Initial radiographic failure could be observed in the furcation area rather than the periapical area following pulp therapy in primary teeth; a phenomenon due to the presence of accessory canals in the floor of the primary molars . According to the findings, involvement of the furcation areas was only present in 3 cases at 12 months after treatment. Pulp canal obliteration was the most common radiographic change at the end of the current study. This phenomenon occurs due to odontoblastic-like activity leading to narrowing of the pulp canal in radiographic assessment. However, this finding is not considered a pathological failure as the canal pulp may be still vital and the pulp therapy may be considered a success in the absence of clinical symptoms in the teeth [25, 26]. Dental pulp response to pulpotomy with CEM cement and MTA in permanent non-carious and non inflamed teeth was assessed by Nosrat et al. . Their histological study showed CEM cement is a biocompatible material with hard tissue (hydroxyapatite) induction potential and sealing ability. Other studies have shown that high pulpal connective tissue in caries-exposed teeth with signs of irreversible pulpitis can be healed where stem cells are present in the dental pulp and there is sufficient circulating blood flow [6, 13]. The other properties of CEM cement, such as high alkalinity  and antibacterial effect , may also influence the results. Vital pulp therapy using CEM offers advantages similar to MTA  such as: ease of handling, shorter treatment time and rapid cement application which are important in pediatric dentistry. Also vital pulp therapy with CEM offers an effective alternative treatment to tooth extraction in this group, given the relatively low socioeconomic status of these patients . The main limitations of our study were the limited patient numbers and the possible influence of the young age of the children on their reporting of pain, although the VAS scale was used to mitigate against this factor. Another possible limitation is the lack of histological evaluation of pulp response to the CEM cement in primary teeth. Therefore, we would recommend histological evaluations in future studies. Further clinical studies are also required to assess the effectiveness of CEM cement in primary teeth with irreversible pulpits in the long term in comparison with pulpectomy treatment. Clinical and radiographic findings showed that primary molars with irreversible pulpitis can be successfully treated with vital pulp therapy using calcium-enriched mixture (CEM) cement. The authors wish to thank the Vice-Chancellory of Research of Shiraz University of Medical Science, Shiraz, Iran, for supporting this research (Grant No # 92-5752). The authors also thank Dr. M. Vossoughi of the Dental Research Development Center in Shiraz Dental School for the statistical analysis. The authors thank S. Griffin-Mason (AuthorAID in the Eastern Mediterranean) for help with the English in the manuscript. Smaïl-Faugeron V, Courson F, Durieux P, Muller-Bolla M, Glenny AM, Fron Chabouis H. Pulp treatment for extensive decay in primary teeth. Cochrane Database Syst Rev 2014; 8(8): CD003220. Tannure PN, Azevedo CP, Barcelos R, Gleiser R, Primo LG. Long-term outcomes of primary tooth pulpectomy with and without smear layer removal: a randomized split-mouth clinical trial. Pediatr Dent 2011; 33(4): 316-20. Barcelos R, Tannure PN, Gleiser R, Luiz RR, Primo LG. The influence of smear layer removal on primary tooth pulpectomy outcome: a 24-month, double-blind, randomized, and controlled clinical trial evaluation. Int J Paediatr Dent 2012; 22(5): 369-81. McDougal RA, Delano EO, Caplan D, Sigurdsson A, Trope M. Success of an alternative for interim management of irreversible pulpitis. J Am Dent Assoc 2004; 135(12): 1707-12. Barrieshi-Nusair KM, Qudeimat MA. A prospective clinical study of mineral trioxide aggregate for partial pulpotomy in cariously exposed permanent teeth. J Endod 2006; 32(8): 731-5. Eghbal MJ, Asgary S, Baglue RA, Parirokh M, Ghoddusi J. MTA pulpotomy of human permanent molars with irreversible pulpitis. Aust Endod J 2009; 35(1): 4-8. Holan G, Eidelman E, Fuks AB. Long-term evaluation of pulpotomy in primary molars using mineral trioxide aggregate or formocresol. Pediatr Dent 2005; 27(2): 129-36. Noorollahian H. Comparison of mineral trioxide aggregate and formocresol as pulp medicaments for pulpotomies in primary molars. Br Dent J 2008; 204(11): E20. Simancas-Pallares MA, Díaz-Caballero AJ, Luna-Ricardo LM. Mineral trioxide aggregate in primary teeth pulpotomy. A systematic literature review. Med Oral Patol Oral Cir Bucal 2010; 1(15): e 942-6. Asgary S, Shahabi S, Jafarzadeh T, Amini S, Kheirieh S. The properties of a new endodontic material. J Endod 2008; 34(8): 990-3. Amini Ghazvini S, Abdo Tabrizi M, Kobarfard F, Akbarzadeh Baghban A, Asgary S. Ion release and pH of a new endodontic cement, MTA and Portland cement. Iran Endod J 2009; 4(2): 74-8. Asgary S, Kamrani FA. Antibacterial effects of five different root canal sealing materials. J Oral Sci 2008; 50(4): 469-74. Asgary S, Eghbal MJ. Treatment outcomes of pulpotomy in permanent molars with irreversible pulpitis using biomaterials: a multi-center randomized controlled trial. Acta Odontol Scand 2013; 71(1): 130-6. Asgary S, Eghbal MJ, Ghoddusi J, Yazdani S. One-year results of vital pulp therapy in permanent molars with irreversible pulpitis: an ongoing multicenter, randomized, non-inferiority clinical trial. Clin Oral Investig 2013; 17(2): 431-9. Tabarsi B, Parirokh M, Eghbal MJ, Haghdoost AA, Torabzadeh H, Asgary S. A comparative study of dental pulp response to several pulpotomy agents. Int Endod J 2010; 43(7): 565-71. 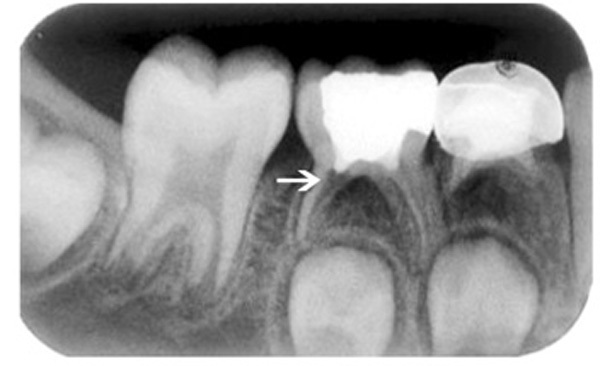 Nosrat A, Asgary S. Apexogenesis of a symptomatic molar with calcium enriched mixture. Int Endod J 2010; 43(10): 940-4. Nosrat A, Seifi A, Asgary S. Pulpotomy in caries-exposed immature permanent molars using calcium-enriched mixture cement or mineral trioxide aggregate: a randomized clinical trial. Int J Paediatr Dent 2013; 23(1): 56-63. Asgary S, Eghbal MJ, Ehsani S. Periradicular regeneration after endodontic surgery with calcium-enriched mixture cement in dogs. J Endod 2010; 36(5): 837-41. Asgary S, Eghbal MJ. The effect of pulpotomy using a calcium-enriched mixture cement versus one-visit root canal therapy on postoperative pain relief in irreversible pulpitis: a randomized clinical trial. Odontology 2010; 98(2): 126-33. Fallahinejad Ghajari M, Asgharian Jeddi T, Iri S, Asgary S. Treatment outcomes of primary molars direct pulp capping after 20 months: a randomized controlled trial. Iran Endod J 2013; 8(4): 149-52. Malekafzali B, Shekarchi F, Asgary S. Treatment outcomes of pulpotomy in primary molars using two endodontic biomaterials. A 2-year randomised clinical trial. Eur J Paediatr Dent 2011; 12(3): 189-93. Khorakian F1, Mazhari F, Asgary S. Two-year outcomes of electrosurgery and calcium-enriched mixture pulpotomy in primary teeth: a randomised clinical trial. Eur Arch Paediatr Dent 2014; 15(4): 223-8. Asgary S, Eghbal MJ, Ghoddusi J. Two-year results of vital pulp therapy in permanent molars with irreversible pulpitis: an ongoing multicenter randomized clinical trial. Clin Oral Investig 2014; 18(2): 635-41. Barrêtto EdeP, Ferreira e Ferreira E, Pordeus IA. Evaluation of toothache severity in children using a visual analogue scale of faces. Pediatr Dent 2004; 26(6): 485-91. Fuks AB. Vital pulp therapy with new materials for primary teeth: new directions and treatment perspectives. J Endod 2008; 34(Suppl 7): S 18-24. Salehrabi R, Rotstein I. Endodontic treatment outcomes in a large patient population in the USA: an epidemiological study. J Endod 2004; 30(12): 846-50. Nosrat A, Peimani A, Asgary S. A preliminary report on histological outcome of pulpotomy with endodontic biomaterials vs calcium hydroxide. Restor Dent Endod 2013; 38(4): 227-33. Maroto M, Barbería E, Planells P, García Godoy F. Dentin bridge formation after mineral trioxide aggregate (MTA) pulpotomies in primary teeth. Am J Dent 2005; 18(3): 151-4. Yazdani S, Jadidfard MP, Tahani B, Kazemian A, Dianat O, Alim Marvasti L. Health technology assessment of CEM pulpotomy in permanent molars with irreversible pulpitis. Iran Endod J 2014; 9(1): 23-9.